IMPORTANT: Your browser must accept pop-up windows. This small database covers physical properties of over seventy popular solvents and liquids that may be encountered in a laboratory. You can easily compare their properties by sorting all substances in ascending or descending order of the desired criteria. The results will be displayed in a new window as a table (an example below). The column containing the selected property to sort by (density in the example) will have a blue background. If, for any reason, you need only a plain alphabetical list of liquids, just click on this link. 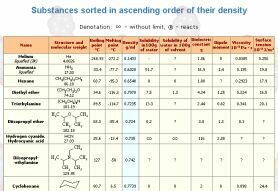 It will lead you to the previous version of this database - just an ordinary list of solvents. Sorting can be a time-consuming process. 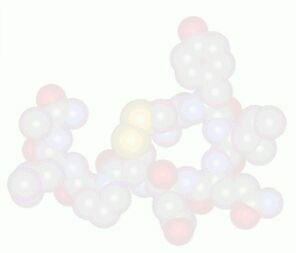 Thus if you are looking for a particular substance, you can save precious time and search the database right away for the compound. The script will find and display in a new window (an example below) each substance that contains the text you typed in its name or in its comment. 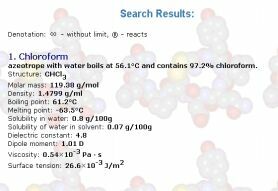 For example typing "chlor" makes the script display properties of chloroform, chlorobenzene, thionyl chloride, etc. If, as in the example, many substances are found they will be displayed in the same order as the result of previous sort. If you do not type anything and press the "SEARCH" button the script will display properties of all liquids.